The Send With... tab of the Settings page is the most important section of the Settings page, as it determines how your newsletters are sent. After installing the MailPoet plugin, you should immediately go to the Send With... tab! If you don't, your emails will most likely go straight to spam. Here, you can select how you want to send your newsletters by clicking on the Configure button. When a sending method is activated, you'll see the word Activated on a green background on the bottom of the selection. What are the differences between the two options? Let's explore the advantages and disadvantages of each. This is the most reliable, faster and most inexpensive method to send your newsletters. It connects your MailPoet installation to our servers through an HTTP connection via our dedicated API. Thus, you can avoid your host blocking your SMTP ports. This is the fastest option because our API is optimized to send fifty emails per connection request. This is over 50 newsletters per second! This is the cheapest method, as it is included for free with many hosting accounts. However, this method usually has the lowest Spam Score possible. Why? Well, because shared hosting accounts are shared. On a shared hosting account, several websites share the same email server. As a result, it's very likely that one of these websites is spamming, which results in the blacklisting of the IP address of the whole server. Please read some more reasons why you shouldn't send with your host. If you are technically competent and manage your own server, this can definitely be the fastest method. You will simply need to fine-tune your own email server to support the high load. However, we still generally recommend against sending your own emails. 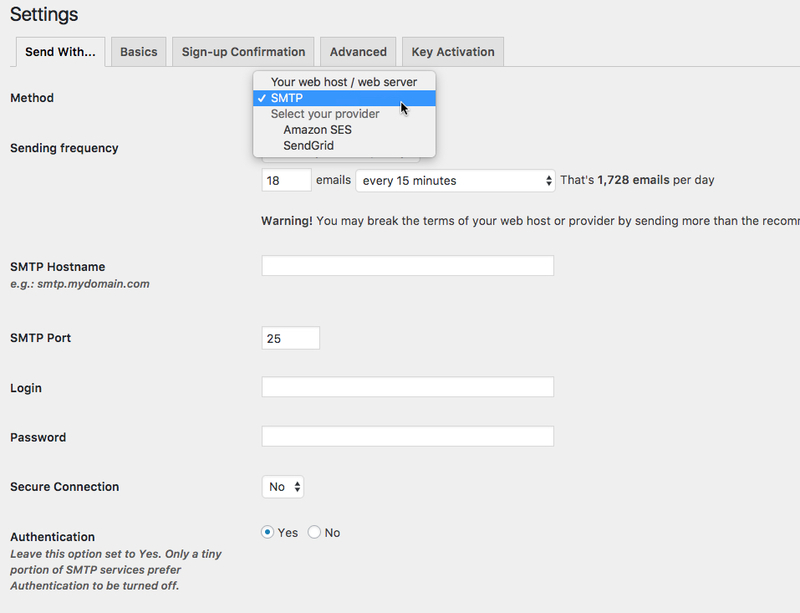 After defining the sending frequency, it's recommended to test the sending method by using Send a test email button. This option allows you to specify an SMTP server to send your newsletters. You can use the SMTP server available from your own host or you can use a third-party one. 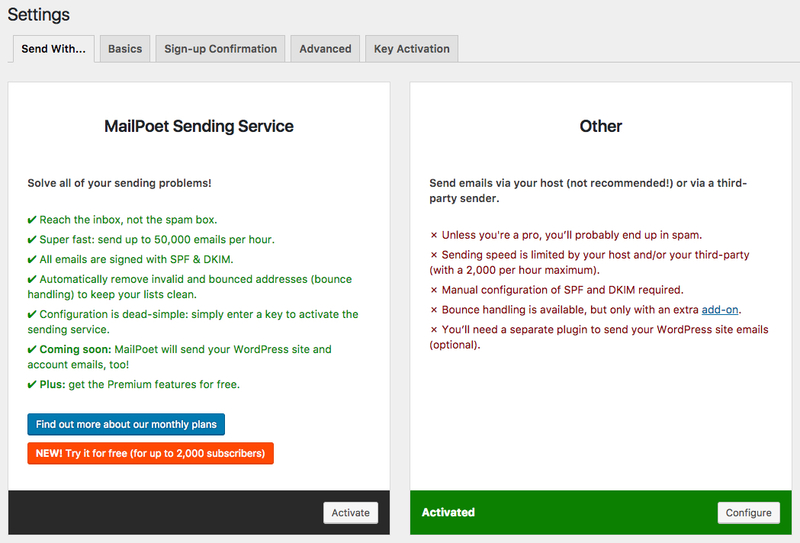 If your host blocks outgoing SMTP Ports and does not have the PHP mail() function available, we highly recommended using the MailPoet Sending Service option or one of these two services listed on this page (Amazon SES or SendGrid). Both of these options support sending emails over their APIs (an HTTP connection rather than SMTP). If you decide to use the Custom SMTP option, be sure to contact your hosting company or email provider for details on setup. Unfortunately, MailPoet cannot provide support for this.